The reduced expression of solute carrier family 2, facilitated glucose transporter member 4 (GLUT4) and hexokinase-2 (HK2) in skeletal muscle participates in insulin resistance of diabetes mellitus (DM). MicroRNAs (miRNAs) have emerged as important modulators of mRNA/protein expression, but their role in DM is unclear. We investigated miRNAs hypothetically involved in GLUT4/HK2 expression in soleus muscle of type 1 diabetes-like rats. In silico analysis revealed 651 miRNAs predicted to regulate solute carrier family 2 member 4 (Slc2a4) mRNA, several of them also predicted to regulate Hk2 mRNA, and 16 miRNAs were selected for quantification. Diabetes reduced Slc2a4/GLUT4 and Hk2/HK2 expression (50–77%), upregulated miR-29b-3p and miR-29c-3p (50–100%), and downregulated miR-93-5p, miR-150-5p, miR-199a-5p, miR-345-3p, and miR-532-3p (~30%) expression. Besides, GLUT4 and HK2 proteins correlated (P < 0.05) negatively with miR-29b-3p and miR-29c-3p and positively with miR-199a-5p and miR-532-3p, suggesting that these miRNAs could be markers of alterations in GLUT4 and HK2 expression. Additionally, diabetes increased the nuclear factor kappa B subunit 1 protein (p50) expression, a repressor of Slc2a4, which was also predicted as a target for miR-199a-5p and miR-532-3p. Correlations were also detected between these miRNAs and blood glucose, 24-h glycosuria and plasma fructosamine, and insulin therapy reversed most of the alterations. In sum, we report that diabetes altered miR-29b-3p, miR-29c-3p, miR-199a-5p and miR-532-3p expression in muscle of male rats, where their predicted targets Slc2a4/GLUT4 and Hk2/HK2 are repressed. These data shed light on these miRNAs as a markers of impaired skeletal muscle glucose disposal, and, consequently, glycemic control in diabetes. Diabetes mellitus (DM) is a complex metabolic disease characterized by hyperglycemia resulting from defects in insulin secretion and/or action; and type 1 diabetes mellitus (T1DM) and type 2 diabetes mellitus (T2DM) are its major forms. It is known that insulin resistance is a current feature in both T1DM (1) and T2DM (2), and directly contributes to the development and maintenance of glycemic homeostasis loss (3). In this sense, skeletal muscle plays a key role. The skeletal muscle represents about 40% of body mass; because of that, it is responsible for ~80% of insulin-stimulated glucose uptake in healthy subjects (3), and is considered the major site of peripheral insulin resistance (4). In skeletal muscle and white adipose tissues, the insulin-mediated glucose uptake is performed through the solute carrier family 2, facilitated glucose transporter member 4 (GLUT4) protein (codified by the gene solute carrier family 2 member 4, SLC2A4). Part of this protein is restrained in tubule-vesicular structures, which are translocated onto the cell surface in response to the hormone (5, 6). After glucose is transported into the muscular cell, it is phosphorylated by hexokinase-2 (HK2) protein to glucose-6-phosphate and then metabolized (2). Thus, GLUT4 protein is the main mediator of extracellular glucose clearance and HK2 is the key protein in the cellular glucose utilization, both playing a central role in the glycemic homeostasis regulation. In DM, the reduction of insulin-stimulated glucose uptake and glucose utilization by skeletal muscle is a current feature (3), which has been related to impaired GLUT4 storage vesicles translocation, strongly related to defective glucose transporter gene and/or protein expression (5, 7, 8). In fact, reduced GLUT4 expression in skeletal muscle has been repeatedly observed in different experimental models of diabetes (9–12) as in humans with insulin resistance and T2DM (13–15). Yet, studies with transgenic animals have reinforced the central role of GLUT4 expression in glycemic homeostasis (7). Indeed, muscle-specific deletion of GLUT4 promotes insulin resistance, glucose intolerance and hyperglycemia (16, 17); whereas muscle-specific GLUT4 overexpression in diabetic animals improves insulin sensitivity and glycemic control (18, 19). Hence, reduced GLUT4 expression in skeletal muscle plays a key role in the pathophysiology and treatment of diabetes; and thus, comprehension of mechanisms related to the regulation of SLC2A4/GLUT4 expression is mandatory. In the last years, the epigenetic regulation of genes related to the pathophysiology of diabetes has received great attention, and one of the essential players in this field are the microRNAs (miRNAs). MiRNAs are a class of short (~22 nucleotides) endogenous non-coding RNA molecules that regulate gene expression at the posttranscriptional level, usually through binding at the 3′ UTR region of target mRNAs, destabilizing them or inhibiting their translation (20). It is estimated that over 60% of all mammalian protein-coding genes may be regulated by miRNAs (21). Several miRNAs have been described as involved in the pathophysiology of diabetes and impairment of glycemic homeostasis (22, 23). Some reports have correlated the miRNAs expression with proteins related to the GLUT4 translocation in skeletal muscle in insulin resistance situations (24–26). However, few studies have investigated the regulation of GLUT4 expression by miRNAs, especially in skeletal muscle under conditions of impaired glycemic homeostasis (27). Moreover, the participation of miRNAs in the regulation of HK2 expression in diabetic states is practically unknown. In this study, we hypothesized that miRNAs participate in the GLUT4 repression in skeletal muscle of diabetic rats, which might be also related to the HK2 expression. Thus, we investigated alterations of expression of miRNAs predicted to regulate Slc2a4/GLUT4 and Hk2/HK2 expression in skeletal muscle of diabetic rats. Through in silico analysis, we have detected that Slc2a4 and Hk2 mRNAs are a potential target of hundreds of miRNAs. After evaluating gene, protein and miRNA expression, using correlation analysis, the results show that miR-29b-3p, miR-29c-3p, miR-199a-5p, and miR-532-3p might be candidates to repress GLUT4 and HK2 expression, which could contribute to glycemic homeostasis impairment in diabetes. Fifty-day-old male Wistar rats were obtained from the Animal Center of the Institute of Biomedical Sciences, University of São Paulo. The animals were housed in a room kept at controlled temperature (23 ± 2 C), in 12-h light/12-h dark cycle, with free access to tap water and standard rat chow (Nuvilab CR1; Nuvital Nutrients S/A, Colombo, Paraná, Brazil). At 70 days of age, after overnight fasting of ~12 h, the animals were rendered diabetic by receiving intravenous injection (dorsal penile vein) of streptozotocin (STZ) (Sigma-Aldrich, St Louis, MO, EUA) at a dose of 50 mg/kg of body weight, solubilized in sodium citrate buffer (0.1 M, pH 4.5); control rats were injected with sodium citrate buffer in the same volume. For this procedure, animals were anesthetized with halothane (Tanohalo®, Cristália, Itapira, SP, Brazil). 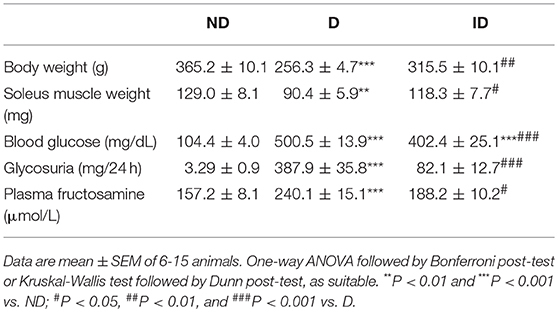 Thirteen days later, the animals were weighed and kept in metabolic cages during 24 h to evaluate urinary volume, glycosuria and glycaemia; these variables were used to confirm the diabetes condition, and to form the three experimental groups: non-diabetic (ND), diabetic injected with 0.9% NaCl as placebo (D), and diabetic treated with NPH insulin (ID). Insulin treatment was performed twice a day (2 U at 8:00 h and 4 U at 17:00 h; Humulin®, Eli Lilly and Company, Indianapolis); and placebo was injected at the same time. Treatments were conducted for 7 days, totalizing 21 days of diabetes. At the end of the experimental period, the animals were again kept in metabolic cages for 24-h urine collection. After that, between 8:00 to 10:00 h (after 3–4 h food deprivation), the animals were anesthetized with 50 mg/kg sodium thiopental (Cristália, Itapira, São Paulo, Brazil), tail blood was collected for glucose measurement, and soleus skeletal muscles were gently harvested, weighted and stored at −70°C for further analysis. Additionally, laparotomy was carried out to collect blood from the inferior vena cava to obtain plasma for fructosamine analysis. All experimental procedures were approved by the Ethical Committee for Animal Research of the Institute of Biomedical Sciences, University of São Paulo (protocol 157/2012), and are in accordance with relevant guidelines and regulations. Blood glucose concentration was measured by a glucometer (Accu-Check Active Basel, Switzerland). Sample from 24-h urine was used to measure glucose concentration by an enzymatic-colorimetric method (Glicose Liquiform, Labtest Diagnóstico S.A., Lagoa Santa, MG, Brazil); the urinary volume was used to calculate the 24-h glucose excretion. Plasma fructosamine concentration was measured by a kinetic-colorimetric method (Frutosamina, Labtest Diagnóstico S.A., Lagoa Santa, MG, Brazil). Evaluation of protein expression was performed as previously described (11, 28). Briefly, frozen muscle samples were homogenized in sucrose buffer pH 7.4 (10 mmol/L Tris–HCl, 1 mmol/L EDTA and 250 mmol/L sucrose), centrifuged at 760 g for 10 min at 4°C, and the supernatant was used as a total cellular protein fraction. Protein concentration was determined by Bradford method (Bio-Rad Laboratories, Hercules, CA, USA). Equal amounts of protein (20–50 μg, according to the target protein) were electrophoresed, transferred to nitrocellulose membrane and immunoblotted with anti-GLUT4 (1:3500, EMD Millipore, Billerica, MA, USA, #07-1404), anti-HK2 (1:1,000, Cell Signaling Technology, Boston, MA, USA, #2867S), anti-NFKB1 (1:1000, Cell Signaling Technology, Boston, MA, USA, #12540S) or anti-RELA (1:450, Abcam, Cambridge, MA, USA, #7970). The membranes were incubated with appropriate secondary conjugated antibody, according to manufacturer's specifications, and signal was detected by enhanced chemiluminescence procedure. The optical density of the blots was quantified by densitometry (ImageScanner III, GE Healthcare, Uppsala, Sweden) and normalized by the densitometry of the respective lane measured in the Ponceau S stained membrane (29). Results were expressed as arbitrary units (AU) per μg of protein, and considering the mean of control values as 100. Evaluation of mRNA expression was performed by reverse transcription quantitative real-time polymerase chain reaction (RT-qPCR) as previously described (30). Briefly, total RNA from frozen muscle samples were isolated with TRIzol® Reagent (Invitrogen, Carlsbad, CA, USA), according to manufacturer's specifications. Total RNA concentration in each sample was quantified spectrophotometrically (Epoch, BioTek Instruments, Winooski, VT, USA) and RNA purity was estimated by the A260/A280 ratio. The RNA integrity was checked by the presence of 18S and 28S bands in a 1% denaturant agarose gel electrophoresis exposed to ultra-violet light (Epi Chemi II Darkroom, UVP BioImaging Systems, Upland, California, CA, USA). To synthetize the cDNA strand from 1 μg of total RNA, the reverse transcriptase reaction was performed using random primers (Invitrogen, Carlsbad, CA, USA), and ImProm-II™ Reverse Transcription System (Promega Corporation, Madison, WI, USA), according to manufacturer's specifications. The conditions of RT reaction were 10 min at 25°C, followed by 60 min at 42°C, and 15 min at 72°C. The qPCR amplification was performed using TaqMan® Gene Expression Assays, TaqMan® Universal Master Mix II with UNG (Applied Biosystems Inc., Foster City, CA, USA), and carried out with StepOne Plus Instrument (Applied Biosystems Inc., Foster City, CA, USA). The PCR conditions were 1 cycle of 2 min at 50°C, 1 cycle of 10 min at 95°C and 40 cycles of 15 s at 95°C and 1 min at 60°C. The target genes evaluated were: solute carrier family 2 member 4 (Slc2a4), hexokinase 2 (Hk2), nuclear factor kappa B subunit 1 (Nfkb1), RELA proto-oncogene and NF-kB subunit (Rela); the reference genes were: glyceraldehyde-3-phosphate dehydrogenase (Gapdh), actin, beta (Actb), hypoxanthine phosphoribosyltransferase 1 (Hprt1) and beta-2 microglobulin (B2m). The reference gene selected was B2m, according to RefFinder algorithm analysis. The method of 2−ΔΔCt was adopted for analysis of relative levels of mRNA expression (31). The primers used and assay IDs are depicted in Table 1. Table 1. Details for the primers and identification (ID) codes of the TaqMan Gene Expression Assays used for quantitative real-time polymerase chain reaction (qPCR). Evaluation of miRNA expression was performed as previously described (32). Briefly, total RNA samples (100 ng) were reverse transcribed using TaqMan® MicroRNA Reverse Transcription Kit and specific miRNA primers from the TaqMan® MicroRNA Assays (Applied Biosystems Inc., Foster City, CA, USA). The RT conditions were: 30 min at 16°C, 30 min at 42°C, 5 min at 85°C, followed by cooling at 4°C. The cDNAs of each miRNA were amplified using TaqMan® 2X Universal PCR Master Mix, No AmpErase® UNG and specific probes for the target miRNAs (Applied Biosystems Inc., Foster City, CA, USA), using a StepOne Plus Instrument (Applied Biosystems Inc., Foster City, CA, USA). The PCR conditions were 1 cycle of 10 min at 95°C, and 45 cycles of 15 s at 95°C and 1 min at 60°C. 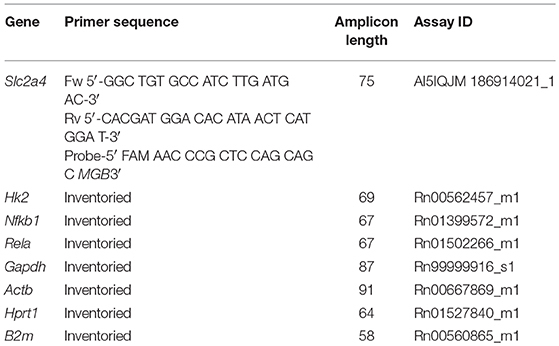 Target sequences and assay IDs for miRNAs and reference genes are depicted in Table 2. The reference gene selected was U6 snRNA, according to RefFinder algorithm analysis. The method of 2−ΔΔCt was adopted for analysis (31). Table 2. 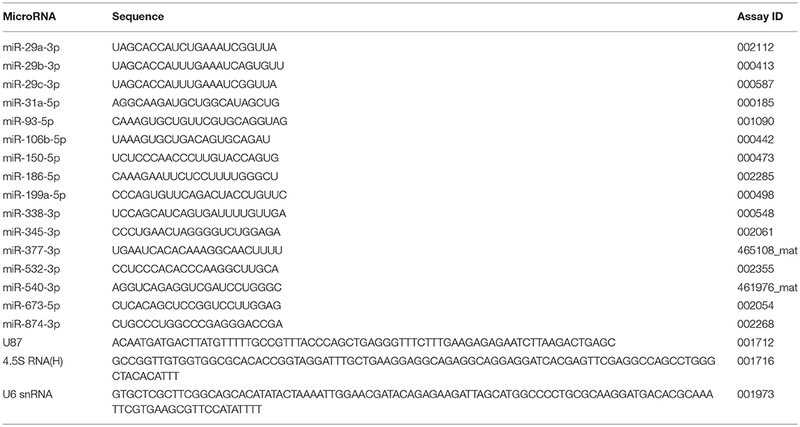 Target sequences and Taqman assay IDs of the miRNAs and reference genes. All data were expressed as mean ± standard error mean (SEM). The comparison of the means, according to normality of the data distribution (Shapiro-Wilk test), was performed by one-way analysis of variance (ANOVA) or Kruskal-Wallis test, followed by the Bonferroni or Dunn post hoc test, respectively. Correlations between proteins and miRNAs, or metabolic variables and miRNAs, were performed by Pearson (r) or Spearman (ρ) correlation coefficient analysis. Comparisons were considered statistically significant at p < 0.05. Analyses were performed using GraphPad Prism 5.0 (GraphPad Software Inc.,). Table 3 shows that, as expected, diabetic rats reduced body and skeletal muscle mass development, and increased blood glucose concentration, 24-h urinary glucose excretion and plasma fructosamine concentration. Insulin treatment restored all parameters, except plasma glucose concentration, which, despite 20% reduction (P < 0.001 vs. D), remained still higher than the ND value (P < 0.001). Table 3. Morphometric and metabolic characteristics of non-diabetic (ND), diabetic (D) and insulin-treated diabetic (ID) rats. Diabetes reduced (P < 0.001) by ~55 and ~77% the Slc2a4 mRNA (Figure 1A) and GLUT4 protein (Figures 1C,E), respectively. Similarly, Hk2 mRNA (Figure 1B) and HK2 protein (Figures 1D,F) were reduced (~50%) in diabetic rats. Insulin treatment restored these variables completely, except Hk2 mRNA, which was only partially reversed (P < 0.05 vs. ND and P < 0.05 vs. D). Figure 1. Diabetes reduces Slc2a4/GLUT4 and Hk2/HK2 expression in skeletal muscle. 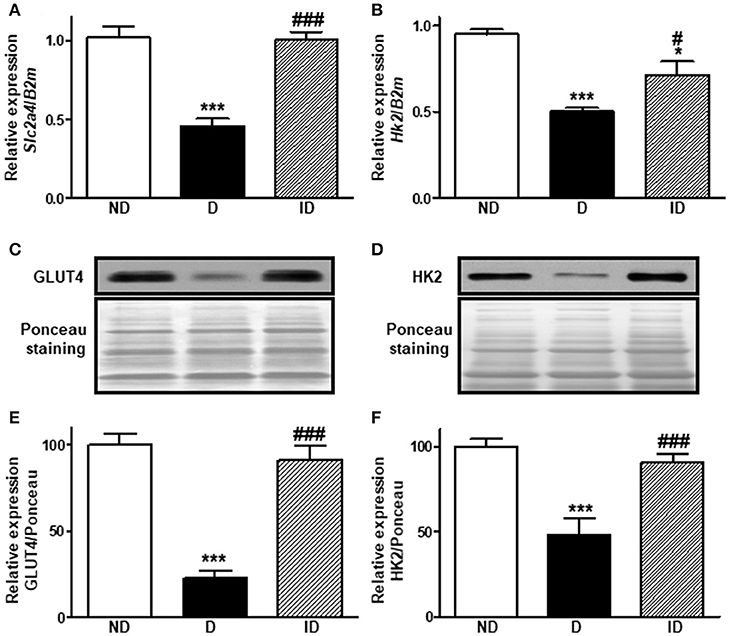 Relative expression of Slc2a4 (A) and Hk2 (B) mRNAs and GLUT4 (C,E) and HK2 (D,F) proteins in soleus skeletal muscle of non-diabetic (ND), diabetic (D) and insulin-treated diabetic (ID) rats. (C,D) Are typical images of immunoblots of GLUT4 and HK2 proteins, and their respective Ponceau-stained membranes. (E,F) Are densitometry analysis of GLUT4 and HK2 proteins. Data are mean ± SEM of 7–12 animals per group. One-way ANOVA followed by Bonferroni post-test: *P < 0.05 and ***P < 0.001 vs. ND; #P < 0.05 and ###P < 0.001 vs. D.
In silico analysis using the miRWalk 2.0 database revealed that 651 miRNAs were predicted to regulate Slc2a4 mRNA by at least one algorithm; and stacked Venn diagram (Figure 2a) shows those pointed out by 4–7 algorithms. Similarly, 613 miRNAs were predicted to regulate Hk2 mRNA and stacked Venn diagram shows those pointed out by 3–6 algorithms (Figure 2b). From these miRNAs, 558 were predicted to regulate both Slc2a4 and HK2 mRNAs by at least one algorithm. Figure 2. Hundreds of miRNAs are predicted to regulate Slc2a4 and Hk2 mRNAs. 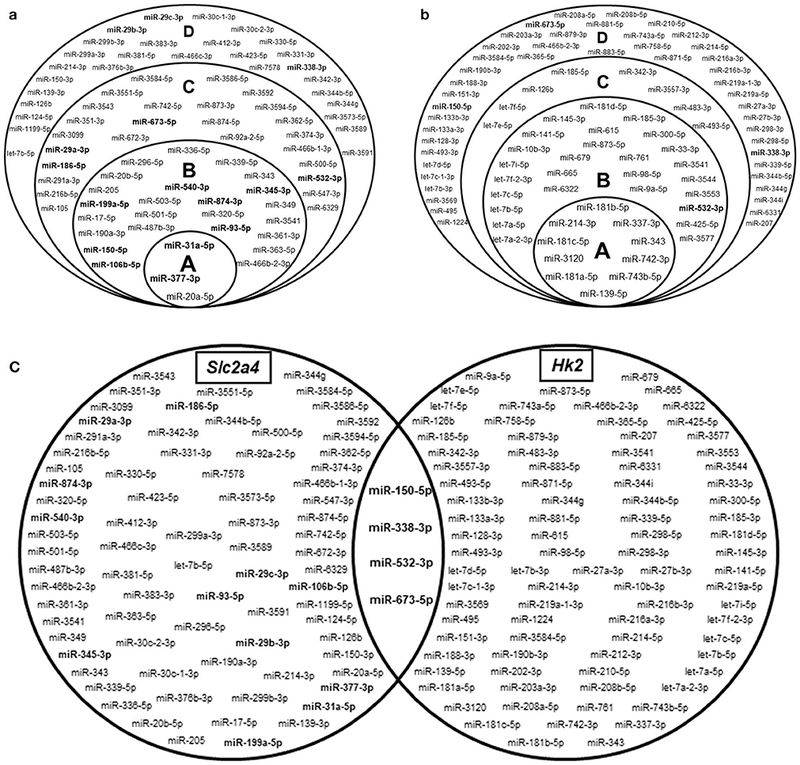 Stacked Venn diagrams showing miRNAs candidates to regulate Slc2a4 and Hk2 in rat. For Slc2a4 (a), circles A, B, C, and D indicate miRNAs predicted by 7, 6, 5, and 4 algorithms, respectively. For Hk2 (b), circles A, B, C, and D indicate miRNAs predicted by 6, 5, 4, and 3 algorithms, respectively. (c) Basic Venn diagram shows the merged miRNAs presented in the stacked Venn diagrams. The miRNAs evaluated in this study were highlighted in bold. Figure 2a highlights the 16 miRNAs selected for analysis in the present study. These miRNAs include: (1) 9 miRNAs (1/3 of 27) predicted to regulate Slc2a4 mRNA by 6 to 7 algorithms; (2) 4 miRNAs predicted to regulate Slc2a4 mRNA by less than 6 algorithms, but also predicted to regulate Hk2 mRNA; (3) 3 miRNAs from the miR-29 family, which are known as regulators of glucose transport and Slc2a4/GLUT4 expression in diabetes (34, 35). Figure 2c combines the miRNAs presented in Figures 2a,b, depicting that only 4 miRNAs are highly predicted to regulate both Slc2a4 and Hk2 genes. Selection of 16 miRNAs for quantification was based on their high prediction to regulate Slc2a4 and previous reports indicate their participation in GLUT4 regulation (7 miRNAs) or in metabolic related dysfunction of muscle and/or adipose cells (9 miRNAs) (34–47). Diabetes increased (P < 0.01) by ~118 and ~51% the expression of miR-29b-3p (Figure 3A) and miR-29c-3p (Figure 3B), respectively. Insulin treatment completely restored the expression of miR-29b-3p. Figure 3. Diabetes upregulates miR-29b-3p and miR-29c-3p expression and downregulates miR-93-5p, miR-150-5p, miR-199a-5p, miR-345-3p, and miR-532-3p expression in skeletal muscle. Relative expression of miR-29b-3p (A), miR-29c-3p (B), miR-93-5p (C), miR-150-5p (D), miR-199a-5p (E), miR-345-3p (F), and miR-532-3p (G) in soleus skeletal muscle of non-diabetic (ND), diabetic (D) and insulin-treated diabetic (ID) rats. Data are mean ± SEM of 6–8 animals per group. One-way ANOVA followed by Bonferroni post-test or Kruskal-Wallis followed by Dunn post-test: *P < 0.05, **P < 0.01, and ***P < 0.001 vs. ND; #P < 0.05, ##P < 0.01 vs. D.
On the other hand, five miRNAs were downregulated by diabetes in skeletal muscle (P < 0.05 to P < 0.001). MiR-93-5p was reduced by ~39% (Figure 3C), miR-150-5p by ~32% (Figure 3D), miR-199a-5p by ~30% (Figure 3E), miR-345-3p by ~23% (Figure 3F), and miR-532-3p was downregulated by ~26% (Figure 3G). Insulin treatment was capable of restoring (P < 0.05 to P < 0.01) the expression of miR-199a-5p, miR-345-3p and miR-532-3p, but had no effect upon miR-150-5p. Considering the important role of miRNAs upon translation of mRNAs, usually destabilizing and reducing the protein translation, the putative relationship between the altered miRNAs and GLUT4 or HK2 proteins was investigated by correlation analysis (Table 4). Results show that miR-29b-3p and miR-29c-3p expression correlates negatively whereas miR-199a-5p and miR-532-3p expression correlates positively with GLUT4 and HK2 expression. In addition, most of these miRNAs also correlated with metabolic variables (glycemia, glycosuria and/or fructosamine), but in a converse way to that of the proteins, and caveating that the correlation between miR-29c-3p and glycosuria displays a marginal significance (P = 0.059) (Table 4). Table 4. 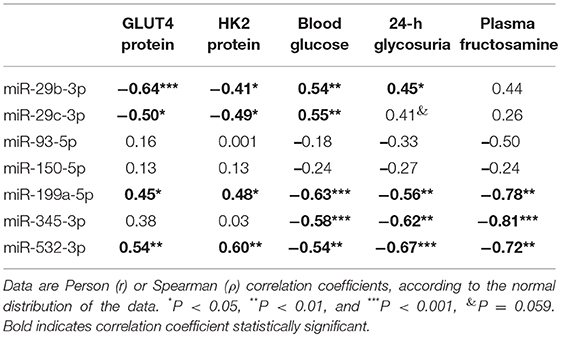 Correlation analysis between miRNAs expression and GLUT4, HK2 or metabolic variables. In order to propose how the miR-199a-5p and miR-532-3p, which correlated positively with Slc2a4/GLUT4, might be participating in the repression of the Slc2a4 gene, we searched whether these miRNAs were predicted to target mRNAs from the Nfkb family, a classic repressors of Slc2a4. In silico analysis indicated that miR-199a-5p targets human NFKB1 and rat Rela mRNAs by 7 and 1 algorithms; respectively, whereas miR-532-3p targets only the rat Rela mRNA by 2 algorithms. So, the expression of Nfkb1/NFKB1 and Rela/RELA in skeletal muscle of diabetic rats was evaluated. Figure 4 shows that diabetes did not alter skeletal muscle Nfkb1 and Rela mRNA expression; however, NFKB1 protein expression (Figures 4C,E) was increased by ~61% (P < 0.05), indicating a post-transcriptional modulation. No changes were observed in RELA protein expression. Figure 4. Diabetes induces NFKB1 protein expression in skeletal muscle. 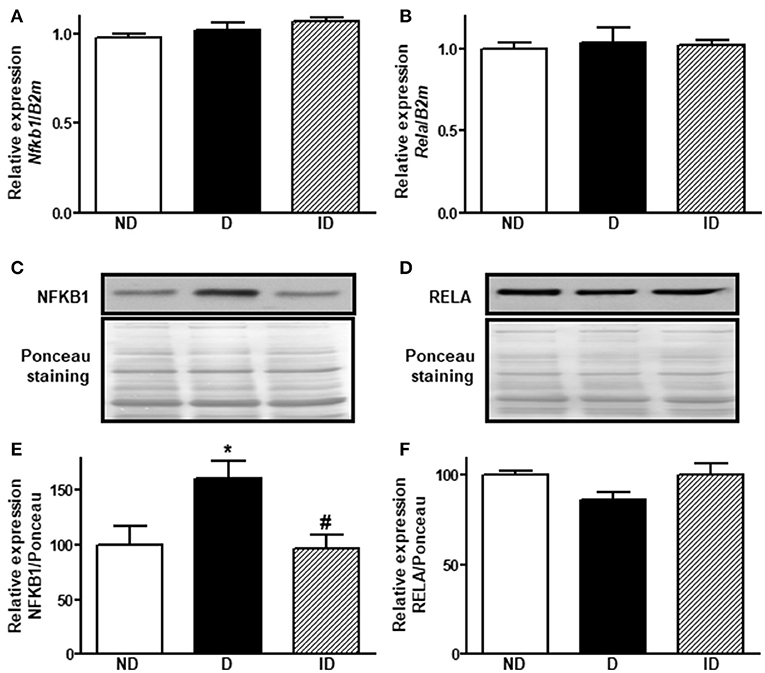 Relative expression of Nfkb1 (A) and Rela (B) mRNAs and NFKB1 (C,E) and RELA (D,F) proteins in soleus skeletal muscle of non-diabetic (ND), diabetic (D) and insulin-treated diabetic (ID) rats. (C,D) Are typical images of immunoblots of NFKB1 and RELA proteins, and their respective Ponceau-stained membranes. (E,F) Are densitometry analysis of NFKB1 and RELA proteins. Data are mean ± SEM of 9–11 animals per group. One-way ANOVA followed by Bonferroni post-test: *P < 0.05 vs. ND; #P < 0.05 vs. D.
Figure 5 shows that the expression of 9 out of the 16 miRNAs investigated was not altered in soleus muscle of diabetic-treated mice. However, miR-186-5p and miR-377-3p expression increased in muscle from insulin-treated diabetic rats, as compared to placebo-treated diabetic rats, and miR874-3p expression also increased in insulin-treated rats, as compared to non-diabetic rats. Figure 5. Diabetes did not alter miR-29a-3p, miR-31a-5p, miR-106b-5p, miR-186-5p, miR-338-3p, miR-377-3p, miR-540-3p, miR-673-5p, and miR-874-3p expression in soleus skeletal muscle. Relative expression of miR-29a-3p (A), miR-31a-5p (B), miR-106b-5p (C), miR-186-5p (D), miR-338-3p (E), miR-377-3p (F), miR-540-3p (G), miR-673-5p (H), and miR-874-3p (I) in soleus skeletal muscle of non-diabetic (ND), diabetic (D) and insulin-treated diabetic (ID) rats. Data are mean ± SEM of 6–9 animals per group. One-way ANOVA followed by Bonferroni post-test: **P < 0.01 vs. ND; #P < 0.05 vs. D.
GLUT4 protein plays a central role in the insulin-regulated blood glucose clearance by skeletal muscle (8, 48). In diabetes, both in T1DM and T2DM, decreased glucose uptake by skeletal muscle participates in the glycemic homeostasis impairment (1, 3, 49), in which reduction in GLUT4 expression must be involved (5, 7, 8, 48). Indeed, reduced GLUT4 expression in skeletal muscle has been repeatedly observed in different experimental models of diabetes (9–11, 12) as in humans with insulin resistance and T2DM (13–15), despite some controversial reports. Thus, by determining defects on Slc2a4/GLUT4 expression-related mechanisms, we can contribute to preventive and/or therapeutic approaches for DM (8). Several studies have inferred modulations in biological phenomena based only on variations in mRNA content, and large-scale analysis of gene expression has contributed very much to that, including studies that involved Slc2a4 mRNA (50, 51). However, discrepancies between Slc2a4 mRNA and GLUT4 protein regulations have for long been reported (52, 53), pointing out the imperativeness of correlating function with protein only, and of considering potential posttranscriptional mechanisms involvement in all Slc2a4/GLUT4 discrepancies. Indeed, in red muscle from STZ-diabetic rat, nuclear run-on analysis revealed a 35% reduction in Slc2a4 transcription, whereas Slc2a4 mRNA was 50% decreased, suggesting a posttranscriptional regulation (54), and discrepancies between Slc2a4 mRNA and GLUT4 protein regulations have been described in muscle from diabetic and insulin resistant humans and rats (52, 55, 56). More recently, miRNAs have been extensively implied in posttranscriptional modification of target mRNAs; thus, potentially involved in regulations of Slc2a4 mRNA and GLUT4 protein (27). Currently, miRNAs have been described as capable of increasing mRNA degradation and/or of inhibiting mRNA translation, the latter inducing discrepancies between mRNA and protein content variations. In this study, DM reduced Slc2a4/GLUT4 expression, and reduction in protein (by 77%) was higher than the reduction in mRNA (by 55%), which reinforces the potential participation of miRNAs in these regulations. Regarding that, among the miRNAs evaluated, only miR-29b-3p and miR-29c-3p were observed to increase in muscle from diabetic rats, and their expression correlates with the GLUT4 expression negatively, suggesting a possible connection, once the miR-29a and−29c have already been validated as repressors of Slc2a4/GLUT4 (35). Indeed, predictable regulation of Slc2a4 mRNA by miR-29a/c-3p has been proposed by in silico analysis (57, 58), and the repressor effect of miR-29a-3p was further demonstrated upon GLUT4 expression in C2C12 muscle cells (57). Furthermore, expression of miR-29a-3p and miR-29c-3p, but not of miR-29b-3p, was described as increased in vastus lateralis muscle from patients with T2DM (35), and GLUT4 protein expression was observed to decrease in mice skeletal muscle overexpressing miR-29a-3p and−29c-3p (35). Finally, GLUT4 expression has been reported decreased in 3T3-L1 adipocytes overexpressing miR-29a-3p,−29b-3p or−29c-3p (59), reinforcing the miR-29s/GLUT4 relationship by gain-of-function approach. On the other hand, despite that only one algorithm predicts Hk2 mRNA as target for miR-29a/b/c-3p in the in silico analysis, the present results reveal that miR-29b-3p and miR-29c-3p expression negatively correlated with the HK2 protein expression. Indeed, miR-29a-3p and miR-29c-3p gain- and loss-of-function approaches in human primary myotubes evinced the repressor effect of these miRNAs upon HK2 mRNA expression (35), revealing a causal relationship. However, the direct binding of these miRNAs into the Hk2 mRNA remains to be demonstrated. Additionally, we highlight that skeletal muscle miR-29 regulation by diabetes seems to vary according to the type of diabetes and muscle fiber. We detected increased miR-29b-3p and 29c-3p in soleus of STZ-diabetic rats; however, Massart et al. (35) reported increased miR-29a- and miR-29c in vastus lateralis of T2DM humans, and increased miR-29a, miR-29b and miR-29c in gastrocnemius of ob/ob mice. The expression of five miRNAs was detected reduced in soleus muscle from diabetic rats: miR-93-5p, miR-150-5p, miR-199a-5p, miR-345-3p, and miR-532-3p. From those miRNAs, miR-532-3p was proposed to target Slc2a4 by 5 algorithms, and the other ones by 6 algorithms, making them strong candidates to regulate Slc2a4. Furthermore, miR-199a-5p and miR-532-3p displayed a statistically significant positive correlation with GLUT4 and HK2 expression, suggesting a possible connection between these miRNAs and GLUT4 and HK2 expression. Concerning miR-199a, reported to be increased in plasma of T2DM subjects, it was described as capable of repressing GLUT4 (39) and HK2 (60), by means of gain- and loss-of-function approaches, in transfected HEK293T, L6, Huh-7 and/or HepG2 cells. Furthermore, miR-532-3p was confirmed as repressor of HK2, also by gain- and loss-of function, in ovarian cancer cells SKOV3 and A2780 (61). However, in the present study, the expression of these miRNAs is reduced in skeletal muscle of T1DM rats, which, by a direct effect, should contribute to increasing the expression of target tissues, instead of the reduction observed. That means, in vivo, in skeletal muscle of T1DM rats, other regulators of gene/protein expression must be overcoming the effect of these miRNAs. Nevertheless, since miRNAs have been acknowledged as repressors of mRNA stability and/or translation, concomitant decrease in miR-199a-5p, miR-532-3p and their targets, as observed here in muscle, would be incomprehensible. However, some studies have reported that miRNAs have the capability of directly activating target mRNAs (62), which merits future confirmation in the present situation. Furthermore, these miRNAs, the expression of which was reduced by DM, might be regulating the Slc2a4/GLUT4 expression through a repressor mediator. Based on this rationale, we investigate the participation of NFKB, a final mediator of inflammatory pathway, and powerful repressor of Slc2a4 expression (63). In silico analysis indicated NFKB1 and Rela mRNAs as target for miR-199a-5p and miR-532-3p; and despite unchanged Nfkb1 and Rela mRNAs expression in muscle of diabetic rats, the p50 (NFKB1) protein content was increased, revealing a posttranscriptional regulation. Regarding that, the miR-199a-5p has already been validated as repressor of the NFKB1 protein in human peripheral blood monocytes (64). Thus, that could explain a connection between these miRNAs and the Slc2a4/GLUT4 and Hk2/HK2 expression. Curiously, in this study, miR-93-5p was detected reduced in muscle from diabetic rats, and without correlation with GLUT4 protein. Conversely, in adipose tissue of polycystic ovary insulin resistant women, miR-93-5p was described upregulated, correlating negatively with GLUT4 protein (36). Besides, 3T3-L1 adipocytes overexpressing miR-93-5p reduced Slc2a4 expression, whereas transfected with antisense miR-93-5p upregulated Slc2a4 expression (36). Finally, by luciferase assay, direct binding of miR-93-5p to the Slc2a4 3′UTR was demonstrated, resulting in reduction of luciferase (36). Altogether, these data indicate a direct repressor effect of miR-93-5p upon Slc2a4 mRNA, and as discussed above for miR-199a-5p and miR-532-3p, reduction in miR-93-5p should be concurring to enhance GLUT4. In summary, the reduction of miRs-93-5p, 199a-5p, and−532-3p, which have been already demonstrated, in vitro, as repressors of the Slc2a4 and/or Hk2, denotes that the final regulation of these targets, in vivo, is a balance of forces, some of them overlapping the direct expected effect of these miRNAs. Nine miRNAs candidates to regulate Slc2a4/GLUT4 were observed to be unaltered in muscles of diabetic rats. Among these miRNAs, miR-106b-5p was already confirmed to target Slc2a4 mRNA by luciferase assay in muscle L6 cells, but it was not triggered by the present DM model (46). Other miRNAs that have already been related to GLUT4 expression, such as miR-23a-3p, miR-222-3p, miR-107-3p, miR-223-3p, and miR-133a/b-3p (27), were not investigated in the present study since they were predicted to target Slc2a4 by only a few algorithms (1–3) using the miRWalk 2.0 plataform. As expected, STZ-induced type 1-like diabetes mellitus impaired muscle and body mass development, as well as promoted high blood glucose, plasma fructosamine and 24-h-urinary glucose excretion. Variables representative of long-term metabolic dysregulation, such as body mass, 24-h-urinary glucose excretion and plasma fructosamine, were reversed by insulin therapy, as well as Slc2a4/GLUT4 and Hk2/HK2 expression and most of the altered miRNAs were. Besides, metabolic parameters correlated positively with miR-29b-3p and miR-29c-3p and negatively with miR-199a-5p, miR-345-3p and miR-532-3p. Altogether, these data suggest that diabetes-induced impairment of glucose homeostasis and/or insulin deficiency play a fundamental role in the regulation of the altered miRNAs, which may contribute to skeletal muscle glucose disposal impairment. However, it is important to highlight that the investigation was conducted in male rats only, and that is a limitation of the present study. In summary, we report that diabetes leads to upregulation of miR-29b-3p and miR-29c-3p expression and downregulation of miR-199a-5p and miR-532-3p expression in skeletal muscle of male rats. These miRNAs are predicted to regulate Slc2a4/GLUT4 and Hk2/HK2 expression, and their variations correlated significantly with GLUT4 and HK2 contents, which were reduced in muscle of diabetic rats, and must contribute to glucose utilization impairment. These data shed light on some miRNAs as a markers of impaired skeletal muscle glucose disposal, and, consequently, glycemic control in diabetes. JE and UM conceived and designed the experiments. JE, CY, DP-J, and FG-R performed the experimental procedures. JE and UM analyzed data. JE, FE, and UM prepared the manuscript. This work was supported by research grant from São Paulo State Foundation for Research (FAPESP) #2016/15603-0. JE (2012/20432-0, 2017/19449-9), CY (2016/251555-5), and DP-J (2012/15514-7) were recipients of FAPESP fellowships. The authors are thankful to Dr. Adauri Brezolin for English revision of the manuscript and to Dra. Maristela Mitiko Okamoto for excellent technical assistance. 9. Hardin DS, Dominguez JH, Garvey WT. Muscle group-specific regulation of GLUT 4 glucose transporters in control, diabetic, and insulin-treated diabetic rats. Metabolism (1993) 42:1310–5. 10. Machado UF, Shimizu Y, Saito M. Decreased glucose transporter (GLUT 4) content in insulin-sensitive tissues of obese aurothioglucose- and monosodium glutamate-treated mice. Horm Metab Res. (1993) 25:462–5. 13. Dohm GL, Elton CW, Friedman JE, Pilch PF, Pories WJ, Atkinson SM Jr, et al. Decreased expression of glucose transporter in muscle from insulin-resistant patients. Am J Physiol. (1991) 260(3 Pt 1):E459–63. 18. Tsao TS, Burcelin R, Katz EB, Huang L, Charron MJ. Enhanced insulin action due to targeted GLUT4 overexpression exclusively in muscle. Diabetes (1996) 45:28–36. 19. Leturque A, Loizeau M, Vaulont S, Salminen M, Girard J. Improvement of insulin action in diabetic transgenic mice selectively overexpressing GLUT4 in skeletal muscle. Diabetes (1996) 45:23–7. 52. Kahn BB, Rosen AS, Bak JF, Andersen PH, Damsbo P, Lund S, et al. Expression of GLUT1 and GLUT4 glucose transporters in skeletal muscle of humans with insulin-dependent diabetes mellitus: regulatory effects of metabolic factors. J Clin Endocrinol Metab. (1992) 74:1101–9. 53. Klip A, Tsakiridis T, Marette A, Ortiz PA. Regulation of expression of glucose transporters by glucose: a review of studies in vivo and in cell cultures. FASEB J. (1994) 8:43–53. 54. Neufer PD, Carey JO, Dohm GL. Transcriptional regulation of the gene for glucose transporter GLUT4 in skeletal muscle. Effects of diabetes and fasting. J Biol Chem. (1993) 268:13824–9. 55. Hager SR, Pastorek D, Jochen AL, Meier D. Divergence between GLUT4 mRNA and protein abundance in skeletal muscle of insulin resistant rats. Biochem Biophys Res Commun. (1991) 181:240–5. Copyright © 2018 Esteves, Yonamine, Pinto-Junior, Gerlinger-Romero, Enguita and Machado. This is an open-access article distributed under the terms of the Creative Commons Attribution License (CC BY). The use, distribution or reproduction in other forums is permitted, provided the original author(s) and the copyright owner(s) are credited and that the original publication in this journal is cited, in accordance with accepted academic practice. No use, distribution or reproduction is permitted which does not comply with these terms.